An adopted Jack Russell terrier tells his story. Beginning with his long night and uncertain future, Lucky recounts 12 years traveling across America with a photographer, and answering the age-old questions like who rescued who? and where in the heck is Wall Drug? Such a sweet book! and funny. I do wish it was linger, i hated to see it end. A great listen, Now I need to go get the book for the for the photo essay. As you listen to the narration from Lucky point of view you will begin to understand who really calls the shots. Well, Lucky is one smart dog! This little Jack Russell really comes to life on the pages. Don't forget to have some tissues handy, there are also lots of humor sprinkled throughout the book. This is a sweet and touching story of a Human who was rescued by Lucky the dog. Just in the nick of time before going to the gallows, Lucky finds his forever home. The story tells the story from Lucky's point of view. I want more! I would absolutely recommend this book to anyone who loves dogs. A sweet and touching story of a Human who was rescued by Lucky the dog. In the nick of time and Lucky found his forever home. Lucky tells his story in a well written and entertaining short story and I want more! I would absolutely recommend this book to anyone who loves dogs. I was given this audiobook in return for an unbiased review. 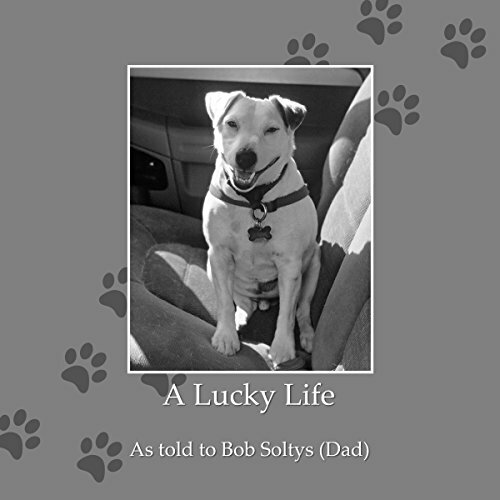 A Lucky Life was such a heartwarming story and told from Lucky's POV. Lucky was literally a last minute rescue making him not only lucky but blessed as well. Thank goodness Bob arrived when he did. Lucky is such a cutie too. I loved hearing his story and the message was wonderful. "Don't take stuff from dog haters". I'm a pet parent of a giant breed rescue and I've had my share of "stuff" from people. I really enjoyed Bob Soltys's story. It was unique in its own way. I hope more people listen and decide to adopt a dog or any pet rather than buy. I think it's so true that they rescue us as much as we rescue them. A touching story about a great dog. What did you love best about A Lucky Life? Well, Lucky is one smart dog! He really comes across as a 3-dimensional character. Humor is sprinkled through out, but don't forget the Kleenex. What other book might you compare A Lucky Life to and why? A Dog's Life, like this story, is told from the dog's perspective. What about Bob Soltys’s performance did you like? Since he's Lucky's Dad, his love for him shines through with a good voice that is strong and clear. More often than not, you'll be smiling while you read, but there are some emotional stories. Where does A Lucky Life rank among all the audiobooks you’ve listened to so far? This is an easy listen, the narrator has a pleasant voice. Lucky, he is a rescue who enjoys bike rides, so cool. Yes, at just over an hour long, it was easy to listen to in one sitting. Would be best accompanied with the text, as much of it relates to photos Bob took, although he does give a link to his website. I think this book was written as a fundraiser for a JR rescue.